A bunch of sanding still to do, but the seats are installed in the cockpit. Man are they huge! I realize the seat backs will take a good chunk out of the seat depth but they are going to be a great spot for sleeping under the stars. 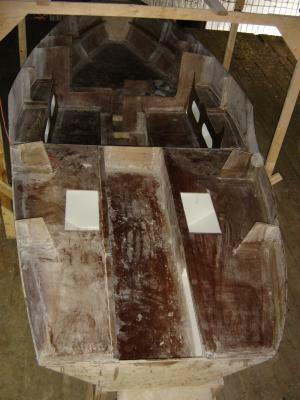 Before installing the sole in the cockpit I glued a few battens to it’s bottom for stiffening and had planned to do the same with the seats. Unfortunately it slipped my mind and only dawned on me as I was sitting back with a “job well done” reward. Oops. Luckily I can still access the underside of the seats, though I’m not sure they’re required after all. I’ve also done a bunch of work below deck – building shelving and backs for the benches. A couple of photos have been added to the photoviewer gallery too (they’re at the end so hit the ‘prev’ button if you want to skip to ‘em quicker). She is looking great! Nice progress. Launch next summer? That’s the plan. Short term I’d like to get the deck on before the end of September. That way I’ll be able to use a small heater to do some work on the interior during the fall and next spring.